Summary : This Stephen Starr establishment serves up some of Philly's best pizzas. The menu doesn't change often, but consistency is key when it comes to the dozen pies made here. I recently spent a weekend in Philadelphia for a wedding. Number one on my to-do list: try some Philly pizza. Although the city is only two hours south of New York (and two hours north of where I grew up in Maryland), I’ve spent very little time there. The last time I was there was more than five years ago… and that was only for 12 hours. Prior to that I spent a weekend looking at UPenn when I was in the 11th grade. So it’s safe to say I was not quite up to speed on food landscape there. For those who are in the same boat as me, a quick run down. There are two guys. Stephen Starr and Jose Garces. They own a lot of awesome restaurants. Eat at one when you’re there. On my short list of pizza places to try were Osteria, Tacconelli’s, and Pizzeria Stella. Osteria had come highly recommended, but has the oddest hours. They’re open daily for dinner, but only serve lunch on Thursday and Friday, so a visit there didn’t quite fit into our schedule. And Tacconelli’s reminds me of a Di Fara knock off — a one-man, one-oven operation that requires calling ahead to reserve your dough! A no-go for our time crunched schedule. So we settled on Pizzeria Stella, a Stephen Starr owned restaurant in the Society Hill neighborhood. And it was a good thing we did. It was fantastic. Although I’d read positive reviews of the place online, I had a couple of worries. First off, I was concerned that those high accolades came from people in Philadelphia, who might have slightly different standards of pizza than people in New York City. Often times pizza places outside of New York get rave reviews, but don’t quite live up to what we have here. My second concern was this it was being backed by a big name restaurateur. I’ve found that recently big names have been jumping on the pizza bandwagon because that’s what’s “in” right now. The thing is… these people don’t know how to make pizza (see: Colicchio & Sons Hops On Pizza Bandwagon & Fails). Even Keith McNally’s Pulino’s didn’t live up to expectations. So it was with great trepidation that I headed to Pizzeria Stella. From the moment I walked inside, however, I was impressed. 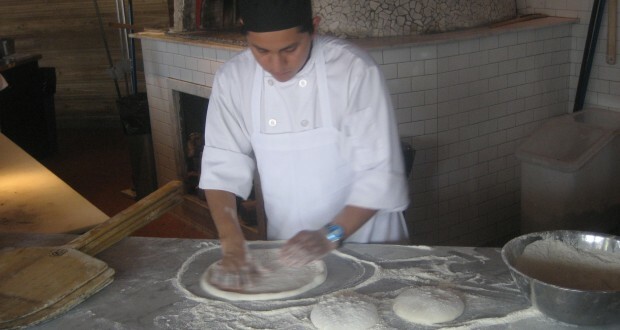 The first thing you’ll notice when you enter is that the dough is being kneaded at it’s own station, separate from the topping station and the rest of the kitchen. Beyond the station is a sprawling wood fired oven. There’s lots of space — both in the kitchen and in the dining room — unlike many cramped New York pizza places. Advantage: Philly. Although it was a breezy fall day, we opted to sit outside. The restaurant is located on a corner and utilizes it’s location to surround itself with outdoor seating. It nearly doubles the place’s capacity. Before I get to the pizza, it’s worth noting that the appetizers we had were delicious. Asparagus ($7) was served with a sunny side up egg and doused in parmesan vinaigrette, while a sizeable portion of arancini ($8) was filled with risotto, topped with parmesan and served in a marinara sauce. A perfect way to wet our palates. There are twelve pies on the menu — which is just about the number of pies I believe a pizza place can reasonable make delicious. Too many more than that and you have to imagine that there are some that will bomb. But too few pies, and the selection suffers. It made sense to start off with a Margherita (san marzano tomatoes, buffalo mozzarella, basil). But the pie I was most looking forward to was Tartufo (black truffle, fontina, egg, parmesan). For starters, it was included in Philadelphia Magazine’s 239 Best Dishes To Eat In Philly. If that doesn’t say awesome… I don’t know what does. What really intrigued me about this pie, however, was the fact that the magazine noted that the egg was broken and spread at tableside. Nowhere in New York City have I experienced a pie topping being applied at my table. But sure enough, when the pie arrived, the waitress broke the egg and spread it on the pie in front of our eyes. While this could have simply been done in the kitchen — 30 seconds prior to when the pie was brought out — I like the notion that a portion of our pie was being made before us. All of the pies were delicious, but the Tartufo ($17) was the standout. It had elements of a breakfast pizza, but I know that I would certainly enjoy it at anytime of the day. It wasn’t too heavy, but the way in which the broken egg mixed with the fontina cheese resulted in an exceptional taste. The Margherita ($13) was on par with similar pies at Neapolitan spots in New York City. It was flavorful and chewy, with slightly more emphasis on the sauce than the cheese. They don’t skimp on the basil either. The Sausage ($15) was good, but definitely my least favorite of the three. I like how the restaurant experiments with toppings like pesto, but I don’t think it particularly meshed well with the strong tomato flavor on the pie. A dining experience at Pizzeria Stella is pretty straight forward. The one-page menu is simple to navigate and pies are named by their ingredients (i.e. Mushroom, Spinach, Pepperoni), unlike many New York pizza places which have become accustomed to creating funky pie names. If there’s one thing I learned while I was down in Philadelphia it’s that there is a lot of great food to be eaten there. The difference is as follows — if you ask a few people for a restaurant recommendation in New York City you’ll get a slew of different suggestions from each person. But if you ask folks in Philadelphia the same question, there will be quite a bit of overlap between their answers. There is great food in Philadelphia, but it’s a handful of places that are making their mark on the city. The same thing can be said about pizza there. The scene is small. But if the quality of pies at Pizzeria Stella is any indication — the future is looking bright for pizza in Philadelphia.